– Public House serving horoscopes, astrology articles and the – very – odd beer! Hey there! Thanks for dropping by THE CAT and ASTROLOGER! Take a look around and grab the RSS feed to stay updated. See you around! ”The history of Greece is that of its loans”, wrote the historian Andreas Andreadis some 89 years ago. Nothing can be more true today. .Much has been written of recent, both in the Greek and international Press on whether Greece will default. Moreover, it has been claimed that Greece has already technically defaulted – because , what is ”debt restructuring” if not default, i.e. the inability of paying debts? The definition of default, in its financial sense, is The failure to meet a financial obligation (in default on a loan). ”Greece reached agreement with the International Monetary Fund (IMF), the European Commission, and the European Central Bank (ECB) on a focused program to stabilize its economy, become more competitive, and restore market confidence with the support of a €110 billion (about $145 billion) financing package. Since then, and due to the severe austerity measures imposed, Greece’s economy went from bad to worse. Finally, on Oct.26, 2011, a restructuring of debt was decided,the so-called PSI ( Private Sector involvement), which is now under way. By March 12th, we should know the results of whether this will be actually consentual or forced bond exchange and whether CDS”s will be triggered. Can astrology help us in identifying defaults in a country’s astrological chart, and perhaps distinguish the various stages and details of these procedures, as of course, a default is not a momentary event , burt a drawn out process with various stages and consequences ? In Greece’s case, since its emergence as a sovereign country, has actually defaulted three times in the past, and paying off loans with further loans with high interest. AS a matter of fact, Greece defaulted EVEN BEFORE IT BECAME A sovereign State. Greece was trying to liberate itself from the Turkish occupation , and Britain was happy to loan the leaders of the freedom fighters , in 1824, actually demanding as collateral the ”national land” . The loans only arrived severely chopped to the Greeks, due to priorly held commissions and interest payments. The default took place in 1827. The defaults , after Greece became a sovereign state, took place in 1843, the second in 1893 ( and was placed under international monetary control in 1898), and the lasttodate in 1932. As we have stressed in previous articles in the past on Greece’s present financial Armageddon, the natal aspect of the Pluto-Jupiter square ( Jupiter ruling the 7th house and placed in the 8th, and Pluto ruling the 6th and placed in the 11th), signifying the country’s dependence on loans from its ”allies”, played a key role in the present situation. This will be shown to be also triggered in most cases where Greece defaulted. Greece had been having difficulty for as of 2009 to finance its heany debt repayment. Finally,The decision for the agreement with the IMF, European Commision and ECB was taken, end April 2010, by the PASOK Govt. under George Papandreou as Prime Minister.. The following chart shows the natal chart of Greece ( internal circle) and the secondary progressions (external circle) for April 27, 2010. The aspect in question was triggered both by sec. Venus, forming a T-square, and by transiting Pluto at 5 degrees of capricorn ( not shown). In addition, we have the opposition of multiple planets in the 3rd-9th houses, which signified the beginning of the overturn of every given and known situation, financial, political, social and so on. WE shall attempt to find out whether this holds true for the previous defaults, and whether any additional factors reveal themselves. Going back in time, at the first default of Greece, in the year 1843 – Greece , after the revolution against the Turks and its independence, became a sovereign state in 1830. The three ”protector Powers” , England, France and Russia installed as governor King Otto, from Bavaria. A loan ha been decided to be given to the country by these Poers. but the loan was squandered amongst the creditors, the King and his acolytes, to the extent tht the country was unable to pay the loan installments in 1843. Then, the ”Protectos” decided to enforce high taxation, austerity measures, and actively intervene in the country;s internal affairs.They wanted to ensure the installments of the loan would be paid, confiscating to that end the income from customs duties. In short, they imposed Fiscal and Political Control. But then, the people, that lived under extreme poverty, took matters into their hands. There was an uprising, and as a result, the ”Powers” backed off from tying to impose Fiscal control, and concentrated on saving the throne instead. There followed a period of political turmoil , and extreme poverty, at least till 1848. Each of the ”Powers” supported different politicians, who would support their interests locally. The chart above is for the period just after the announced default. The natal chart of Greece is in the internal circle, the Solar Arc chart is in the middle , and the transits are shown in the outer circle. We notice that the natal square of Pluto to Jupiter is triggered by the conjunction of Solar Arc Venus to Pluto and the square to Jupiter. S.A.Moon is forming a T-square with the latter combination indicating the inability to pay off the loans and the accompanying imposition of Control by the Powers/creditors/allies. In addition, transit Venus is conjuncting Natal Pluto at 6 degrees Aries, aided by Transiting Uranus, that has just entered Aries at 0 degrees. Transiting Mars is forming a T-square, with n. Venus and n. Moon, usually present at social upheavals in the country. The relative success of the uprising may be attributed to the sextile of S.A. Mars to natal Sun. An additional point, which wi will see in future defaults is the triggering of natal Neptune at 21 degrees Capricorn by the square of Solar Arc Pluto and transiting Pluto, plus the conjuntion of Solar Arc Jupiter and Transiting Saturn. Saturn indicates the poverty and hardship of the people. Neptune in the 8th house of a chart indicates deceptive or secret circumstances in relation to loans, and when afflicted, shows losses under bizarre financial conditions related to partners, or creditors’ financial affairs. Jupiter and Uranus are the allies/partners from foreign lands. Natal Neptune is conjuncted by S.A. Jupiter, ruler of the 7th ( the allies/partners, from foreign lands), while Trans. Neptune conjuncts S.A. Uranus, in the 9th house. This complex astrological ‘story’ describes quite well the indeed complex historical facts, with all the foreign powers involved , influencing all affairs to their own benefit, and aided and abated by local bankers and merchants, while the peoepl lived under conditions of extreme hardship. The next default took place in December 1893,during the administration of the prime Minister Harilaos Trikoupis. He had accomplished a lot in laying down the foundations of creating an infrastucture for Greece, such as roads, the Korinth Canal etc. However, he did resort to loans with extremely harsh terms. Despite his efforts, and being actively opposed by the King, he did try to make a settlement with the creditors. They, in order to agree, asked to have complete fiscal control of the country. Trikoupis refused, considering that the country would thus lose its sovereignty. Extreme social unrest ensued, due to Trikoupis’s efforts to raise taxes. Greece, being unable to secure further loans to repay the exorbitant interest rates, defaulted in 1893. Trikoupis remained as Prime Minister till 1895. The administration that followed led the country into a disastrous war in 1897, followed by INTERNATIONAL FISCAL CONTROL in 1898, which secured all income from major taxation in order to pay back the creditors. The latter ended 80 years later – in 1978!! The chart below is depicting the secondary progressions ( middle circle) and transits ( external circle) at the time of the default in 1893. The natal chart is as always in the internal circle. The next default occured in1932. Greece had again taken heavy loans in order to participate in the first world war ( as requested by its allies, who never paid them back the funds spent for war expenses, as originally promised). In addition, it took more loans to assist the deposed Greeks of Asia Minor in Turkey, who fled to Greece as refugees, after the 1922 Catastrophe. In 1932, and following the international financial crisis of 1929, Greece’s finances were in direstraits again. In addition, the drachma currency was linked to the ‘Rule of Gold’ so it could not be leveraged ( something like the hard currency of the Euro today). Greece, under the leadership of Prime Minister Eleftherios Venizelos, asked the INTERNATIONAL MONETARY CONTROL for a 5- year moratorium of interest payments plus an additional loan. The I.M.C. just gave them a 1-year moratorium. Thus, Greece was forced to cut the interest payments by 25%, this amounting to default, and disengage the drachma from the Rule of Gold. The stalling of interest payments was not so bad for the finances of the State, as it helped to balance the budget. However, the situation was extremely difficult for farmers and workers due to the low wages imposed by Venizelos. This led to social unrest, strikes, that led to the ‘bloody’ May 1st of 1936 events in Thessaloniki. In addition, the poorer farmers suffered extensive damage from the crisis, while they swa the income of richer land owners increase significantly. A period of short-lived governments and military coups ensued till 1936, as the political system had lost the support of the people. The period ended with the dictatorship of Aug. 4, 1936, imposed by Ioannis Metaxas ( he was actually elected prior to the dictatorship). The latter established the payments of external debt again, and took more loans with dire terms from England and Germany. Below is the sec. progressed chart for 1932. The chart below is the Solar Arc one for the same period. BOTH THE ABOVE FORMATIONS WILL BECOME EXACT AT THE TIME OF THE DICTATORSHIP OF 1936. Before coming back to today, let’s take a brief look at the events in the meantime. Greece was occupied by Germany during the 2nd World war , and its infrastructure and economy was ruined. Germany did not pay any war compensations for damages. The country did receive some funds from the US marshall plan, but a large part was spent on military expenses as there was a civil war after WWII. It is noticeable that the debt started to go haywire after 1981, when Greece entered the European Economic Comunity -EEC- and when the PASOK party came into power. it remained in power up to Nov. 2011, with a brief interval in 1989-92 ( coalition govt. and 2 years of New Democracy party administration). This party , under Andreas Papandreou at first, received large loans, spent lavishly, appointed large numbers of employees in the public sector, and living standards went up, while productivity went down. Still, the high Debt/GDP was managed by the fact that Greece had its own currency, the drachma. In Jan. 2000, the drachma was actually overvalued , and Greece entered the Eurozone, under the administration of PASOK Govt. with K. Simitis as Prime Minister, and director of the Bank of Greece Loukas Papademos ( the current Prime Minister of the coalition Govt who is managing the present bailout / default). Greece , as mentioned, with the fear of default in April 2010, was placed under a ”Memorandum of Understanding ‘ with the IMF ,ECB and the EU ( Troika) to receive a bailout loan , in order to repay its debts. The debt /GDP at the time was 120%. The austerity measures imposed were such that threw the country into a deep recession, the country having lost 20% of its GDP in 2 years, unemployment doubled, heavy taxation was imposed and the debt/GDP reached 165%. In Nov. 2011, a second bailout was determined which, optimistically, plans for the debt to reach 120% GDP in 2021, meanwhile imposing even harsher austerity measures and having no concrete measures that aid growth, except decreases in salaries and pensions and increase in taxation, and selling off at low prices public land and profitable public companies. This entails a large haircut ( 53%) of present debt only with the Private sector ( PSI), but not the ECB or debt held by countries or the IMF. In exchange, the country is signing its sovereignty away, in the new ”Loan Treaty’ to be signed in March 2012. Technically, as Fitch ratings mentioned, the PSI and accompanying deal is a ‘Default’ , although ‘restricted’. Below is the secondary chart and the transits for March 15, 2012 ( the PSI will have been completed, by March 12, provided there is wide participation by bond holders). There is still animation amongst bondholders whether this will be considered as a ”credit event”, thus triggering CDS’s, or not. – Prog. Moon opposition Prog. Sun and Mercury, Prog. Asc. squares the natal opposition of Sun-Uranus opps. Saturn, and Trans. Jupiter-Venus turns this into a Grand Cross..
– The T-square formed by sec.Venus to the natal Pluto -Jupiter square , is triggered by trans. Uranus -Mercury and by Pluto-Moon. From the political point of view, the inevitability, and the rigidity of the Grand cross in fixed signs, shows that Greece has been pushed against a wall and is in ”lose-lose” situation, from the side of partners, foreign interests , and its own Government. This can be linked to the fact that , as many analysts have written,the said ‘bailout’ does not appear to get Greece out of deep fiscal depression, on the contrary, it drives it more deeply into depression. However, it does rescue banks from bankruptcy, with European taxpayers money , through the ‘back door”. The latter astrological aspect shows the political upheaval within Greece. The political parties are in a fluid situation, new alliances are formed by parties with an Anti-Memorandum of Understanding / Troika stance. 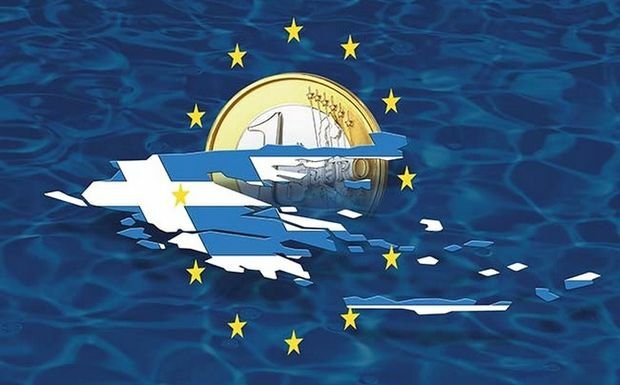 Still, it is unlikely Greece will be able to get out of signing the disastrous new ”Treaty” with the Troika, thus giving up sovereignty in the case it is not able to meet its fiscal obligations to them in future. One point worth mentioning , with reference to the astrological plot at play, is that natal Neptune has been squared by Saturn at Oct. end 2011 ( when the present bailout was decided, accompanied by additional extreme austerity measures.By then,it had become obvious that the bailout determined only 3 months before was in no way adequate). In addition, beg. Nov. 2011, the PASOK Govt. resigned an a coalition Govt.supported by three political parties, came into power under L. Papademos as Prime Minister. Saturn will square natal Neptune again in June 2012. 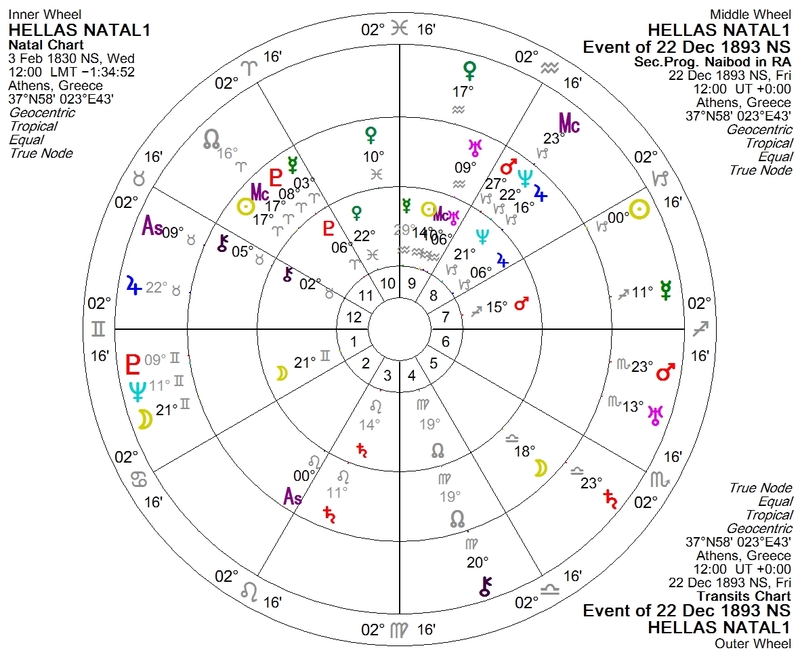 But as we have seen , natal Neptune is always involved in the ”final act” of defaults in Greece, and the political upheavals/changes that the periods entail. This happens several times in future : It will be opposed by Tr. Jupiter in Oct-Nov. 2013 while at the same time the previously mentioned opposition In the 3rd-9th house wil be squared by Tr. Saturn. That time will be particularly tumultuous for Greece – and not only Greece, because the Euro astrol. chart is triggered adversely at the same time ( but that is another long story). Later on, Neptune will be squared by tr.Uranus ( summer 2015- spring 2016). The conjunction of tr.Pluto will start in 2018. So, next week is in no way the end of the Greek tragedy : it is rather a stage of a long, very bumpy ride that Greece has to go through, more like the route Odysseus had to take to escape both the two terrible monsters, Skylla and Charybdis! We shall follow the coming events concerning the Bailout ( or default, or credit event, as the case may be) of Greece , and try to correlate events with the relevant astrological indicators, as defaults are never isolated , clearly marked events, but a complex puzzle of fiscal and political aspects. Reuters:What happens if Greece defaults? Following the completion of greek debt restructuring, and the use of CAC’s for bondholders who did not voluntarily accept the restructuring, the triggering of CDS’s was determined. This means the restructuring has been classed as a ”CREDIT EVENT” i.e. a default. In the chart of Greece, ( see previous chart for MARCH 15 ) the T-square of prog. Venus- natal Pluto-natal Jupiter was triggered by the transiting T-square Mercury conj. Uranus square Pluto opposition Moon. As we have already mentioned, the Venus-Pluto-Jupiter T-square is has been triggered in past cases of default as well. Along with the latter transits, the transit of Jupiter conj. Venus, creating a trine to natal Jupiter, made this whole affair to be presented as a ”success” in Greece, and interantionally it did not make a big stir as it was expected, or ”priced in” , as it is called in market terms. However, the effect of Jupiter is short-lived . The same transit by Jupiter occured in July 2011, when a first restructuring of only 21% was decided. That soon proved to be totally inadequate and the Jupiterian exuberance quickly died down. That’s a rather good study. I cannot understand though why you use an outdated chart as the “foundation chart” of Greece. The February 3, 1830 chart represents the “Kingdom of Greece” which the foreign powers imposed to the newly born Greece back in 1830. Monarchy though has been abolished in Greece since 1974… I think you should take in consideration the January 1st, 1822 chart, based on the date the Greeks declared both their independence from the Turks and their “political existence”. As you are aware, countries/states often have different charts during their history, based on important events . Still, the 1830 chart is the one that modern Greece came into being as a sovereign State. The important thing about a country’s chart is whether the chart does reflect future events in the country’s history- this chart does so. Other astrologers use other charts, e.g. the July 24 1974 one, when Greece became a Republic- and from what I have read , it has merit also. I have not used, or researched the chart you mention. It is certainly interesting if one used it to see if it reflected events in Greek history, e.g. what we are going through at this period. The Astrology of Facebook: You can’t have 500 million friends without making a few enemies!